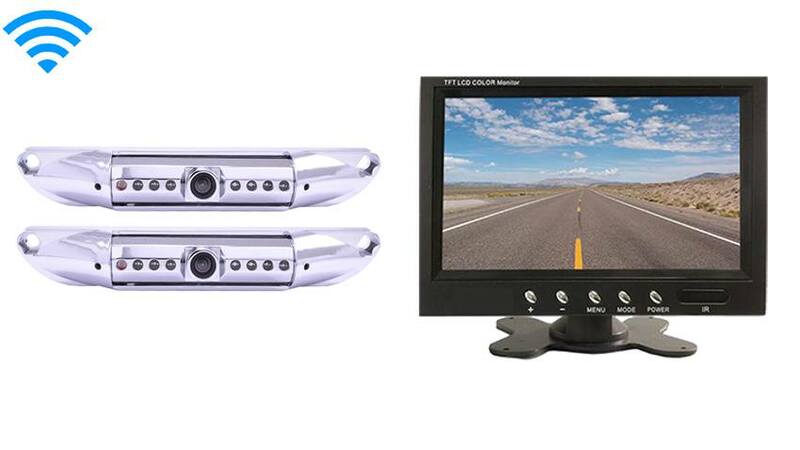 7-Inch Monitor | 2 Wireless License Plate Backup Cameras Great for Trucks, and Hooking up a trailer to your hitch! The Black License Plate camera is mounted by screwing your current license plate screws through its brackets; it’s a very simple installation. The camera can also be adjusted by angling the camera up or down so you can get the perfect view for your car. The CCD lens is the clearest and highest quality camera TadiBrothers sells, also called the HD Backup Camera. There is no need to drill any holes or install mounting brackets. The Hitch camera has a 120° angle which is best for Cars, SUVs, and pickup Trucks. With 120° everything behind the vehicle can easily be seen, it is also color, waterproof and has military grade night vision. The camera and mount are made of steel for ultimate durability in the roughest weather conditions. In this system, you get 2 cameras and you can mount these cameras anywhere you want. They work next to each other or far from each other, it makes no difference. Basically, it is up to you where you want them and what you want to see, the possibilities are endless. "Wireless works as advertised, I am happy with the quality. My vehicle is 22ft long and both cameras have NO static. Good item and consistent results"
"I was not sure how i was going to set it up when i got the item until i opened the instruction manual and i saw how much Tadibrothers cares, these are clearly done by Americans and I they were very easy to folly. After i installed the wireless it worked perfectly the first time I fired up the system and i have never even seen a flicker. Good job A+++, i am Tadibrothers convert!"